Jimson weed (Datura stramonium) is a beautiful, witchy plant that begins blooming in late summer and continues through the first frost. A member of the notorious nightshade family, its more famous cousins include tomato, eggplant, pepper, tobacco, and potato. Most members of this plant family are poisonous, and jimson weed is no exception. All parts of the plant are toxic, most particularly the seeds. Potent amounts of alkaloid compounds are present, which potentially cause convulsions, hallucinations, and even death if ingested. And as climate change increases the amount of carbon dioxide in the air, studies have found that the toxicity of plants like jimson weed only increases. The genus name Datura comes from the Hindi word for the plant, noteworthy since most botanical names are derived from Latin or Greek. The origins of the plant itself are contested—every source I checked listed a different native origin, ranging from Mexico to India, and it now grows all over the world. Not surprisingly, it has found its way into many cultural and medicinal traditions. Ayurveda, traditional Chinese medicine, and Native American shamanistic practices all employ jimson weed medicinally or ritualistically. Its seeds and leaves are used as an antiasthmatic, antispasmodic, hypnotic, and narcotic. Jimson weed’s white to purple blooms are fragrant at night, attracting moths and other nocturnal pollinators, a common trait in white-bloomed plants. The rest of the plant, however, is stinky! Crush and sniff the oaklike leaves, and you’ll understand why domesticated and wild animals avoid eating this plant—it smells a bit like feet. Indeed, accidental poisonings tend be more common among humans than among other animals. Though the trumpet-shaped flowers are stunning, my favorite part of the plant is the devilish-looking seedpod. 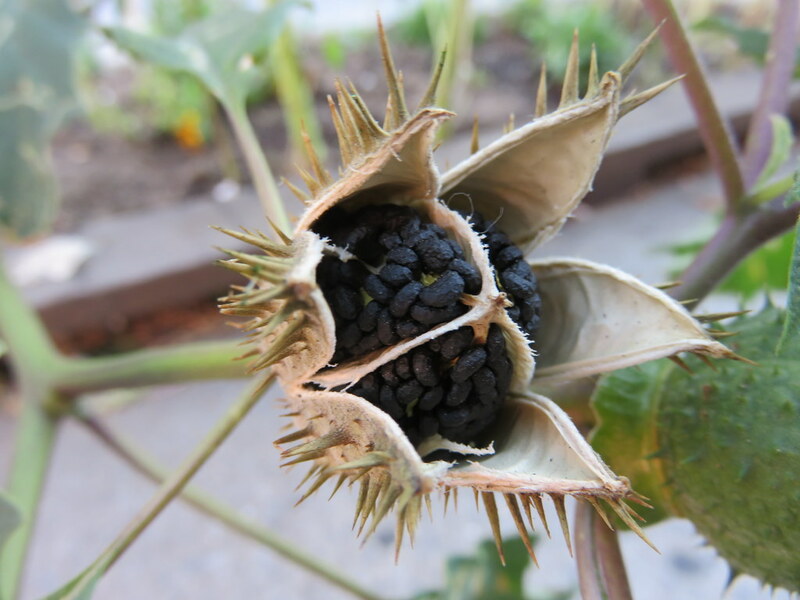 The size of a Ping-Pong ball and covered in spikes, the seed capsule splits into four parts like a monster’s maw, revealing the dark brown seeds inside. In the winter you might notice its tall, dry stalks bearing the prickly seedpods, which to me look like the scepter for a demon. With all its extraordinary looks and lore, jimson weed is a fascinating plant to contemplate (but maybe not cultivate)! The species you are referring to that blooms at night is NOT jimson weed, it’s a moon plant. It is part of the jimson family but not what people will find just growing in their yard in certain areas. Pure jimson weed blooms in the day that’s how you know the difference. Hello, I just found this beautiful plant in my garden this year and was to excited UNTIL I read your article. How do I dispose of it? Every year, I deliberately allow this weed to mature in my wildflower garden. The flower is breathtaking, its fragrance is intoxicating (but not hallucinating, lol), and best of all it attracts the biggest, wildest-looking moth you have ever seen. Definitely makes for an enchanting evening. I wonder why plants, like Jimson weed, are not completely wiped out of the earth surface! Soo many young men have run mad by deliberately ingesting such plant parts. What is the best and safest way to dispose of this plant? Had a bag of potting soil and this grew out of it. 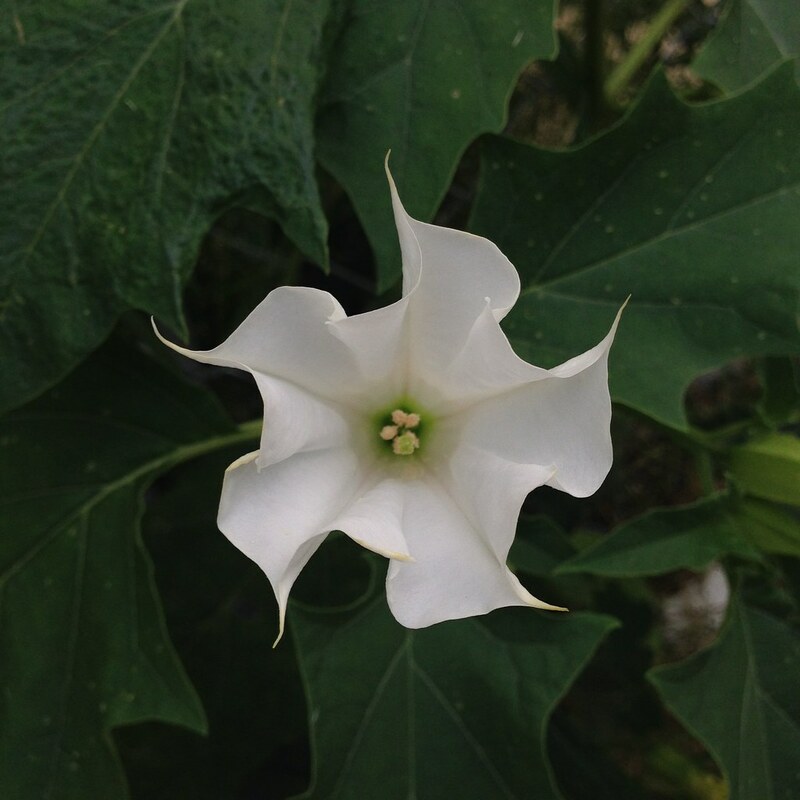 Open flower of Datura stramonium (jimson weed). Photo by Saara Nafici. 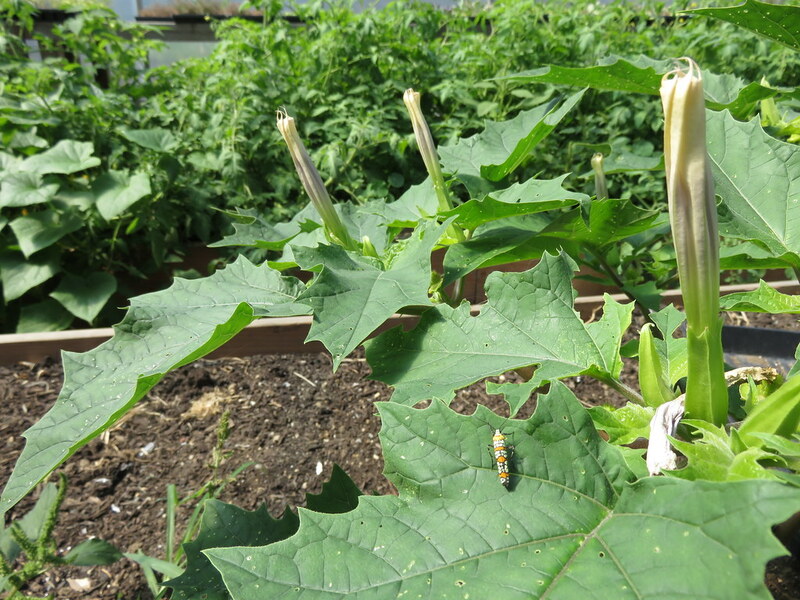 An ailanthus webworm moth (Atteva aurea) on jimson weed (Datura stramonium). Photo by Saara Nafici. 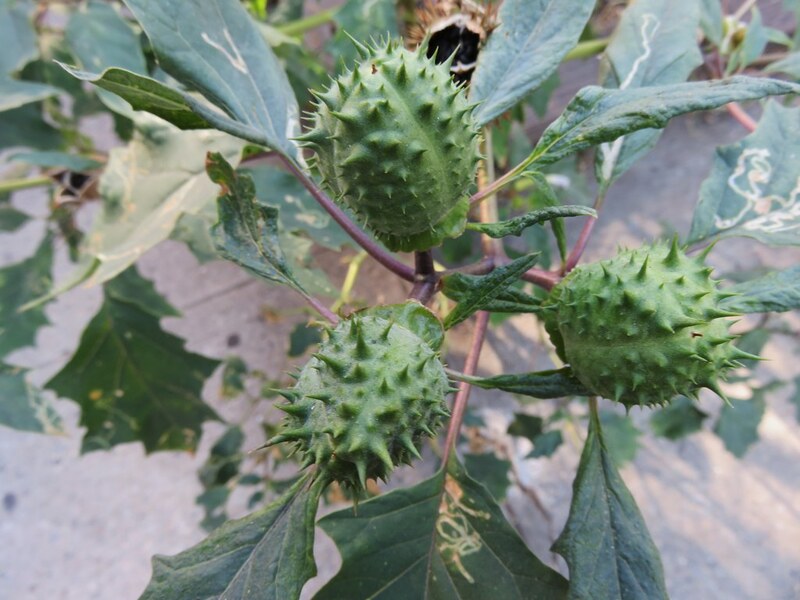 Spiky green fruit of Datura stramonium (jimson weed). Photo by Saara Nafici. Dry seedpod of Datura stramonium (jimson weed). Photo by Saara Nafici.